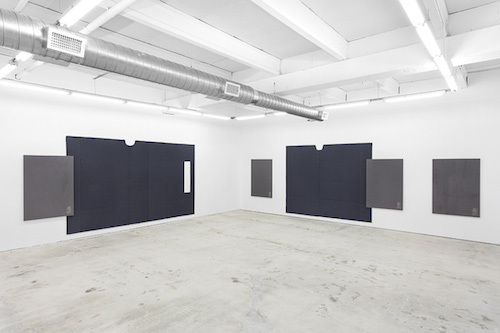 View of “Egan Frantz: Monday and Friday, Tuesday and Friday, Wednesday and Friday, Thursday and Friday, Friday and Friday,” 2014–15. Even ghosts require a medium in order to take form. This seems to be in part the operative logic of Egan Frantz’s current exhibition. At once liminal and concrete, seven sculptural pieces are installed decisively across the four walls of the gallery. Stark and design influenced in look, these sculptures call to mind enormous razor blades from a distance. Evenly spaced, judicious in presentation, they are intriguing in their deceptive simplicity. At first glance, one gets the impression of looking at monochrome paintings connoting a brooding Gerhard Richter in their grayness. Upon closer inspection, the weight of the installed presences becomes unavoidable, as the monochromes reveal themselves to be suspended slabs of heavy, dark marble. Hung against the backdrop of prefabricated, idiosyncratic, quilted elevator liners, references to floating apparitions abound. Using strategies of seriality and banality, traces of personal dry-cleaning receipts are etched into the lower right-hand corner of each hard stone. Their inclusion is humorous in one sense but also suggestive of the revealing ephemera that haunt the monotony of quotidian life. Atop these receipts is the hidden pièce de résistance—Frantz’s logos—an image of a low ghost. This spectral icon consolidates the poetic eloquence of this exhibition. It exemplifies the richness of metaphysical puns oscillating between Lowghost #22, Lowghost #24, and Lowghost #26 (all works 2014). With their repetition, like the ghosts they conjure, combined conceptual and material concerns evocatively fade in and out of being.